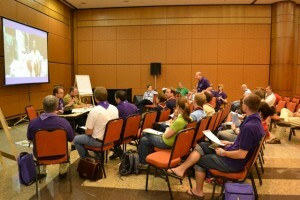 Representatives from European and African NSOs/NSAs as well as European and Eurasian NSOs/NSAs gathered together in Curitiba on Sunday, 9 January 2011, for two Contact Meetings, facilitated by the European Scout Committee with the Africa Scout Committee and Eurasia Scout Committee respectively. The meetings follow the first such gatherings which were convened in Korea in 2008, but this time, there was more advance warning and structured agendas for the meetings. As a result, levels of participation and the quality of the contributions was positive. The responses from NSOs/NSAs attending both of the meeting was generally positive. Henrik comes from Finland and is Vice-Chairman of the European Scout Committee. He is following the Region's work on Partnership with other Regions and on External Relations and Funding. Henrik is also committee contact for Albania, Croatia, France, Italy, Monaco and San Marino. There will be a second Europe-Eurasia Contact Meeting on Tuesday, 11 January at 19:30 until 21:00 in the European Scout Committee’s meeting room on Level 5, Room 3. Great to hear that the meetings were both well attended and gave some valueable output! I hope these meetings really help NSO’s from the different regions get to know each other better and create partnershps that will help us grow scouting both in Europe and elsewhere.